Home » His Coming » What is the name of the Father? One of the elements of the name of the Father is life, which is externally manifested by sound ‘UHA’ in a newborn’s cry. It is so, it being the sound of presence of life in a newborn, upon birth. No wonder that there are verses, which show the Father’s love of children, whose innocence is less likely affected by wrong teaching, more than that of adults, such as in Matthew 18:1-5 , Mark 10:13-16, Matthew 19:13-14, Matthew 18:10, Luke 9:46-47 and Mark 9:35-37. Also, the ‘UHA cry’ in newborn is not affected by languages, in fact, it is universally heard by people, with varying languages. Thus, the opinion stating that His name would depend on the language of an individual is not, at all, reasonable and logical. as the sound ‘Yah’ in ‘Hallelu-YAH’ in Revelation 19 and ‘UHA’ even exist in non-Hebrew languages. It is therefore also reasonable to say that languages, which are not in the lingua of a newborn, can confuse the understanding of people, especially in English language, where one word may mean differently according to use, which was taken advantage by deceivers, to hide the name the Father and the son, even in the bible. When hearing the ‘UHA cry’ in a newborn, it appears, by instinct, that he or she is calling and acknowledging, through his cry, the Father, who is the source of life, at birth. This is not true, however, to adults, as most of them refuse or fail to acknowledge the name of the Father. It is because, they were taught to acknowledge the name of false god Jesus or other false gods, depending on religious belief. They may even preach the name of their false god by falsely declaring them worthy of praise and worship. 16 and said to him, “Do you hear what they are saying?” Yahushua (Jesus) said to them, “Yes. Have you never read, ‘Out of the mouths of children and nursing infants you have prepared praise for yourself’?”(New English Translation (NET) revised). How was the name of the Father, which is also reflected in the name of the son, suppressed or put in vain by writers in the past, which is now inherited by new generation, who are compelled to subscribed to fictitious name Jesus? One-it is through the alleged translation of the Hebrew scripture to Koine Greek in a document, what is now called as Septuagint. Two-by the introduction of the name Jesus Christ in Christendom. And third, by the different versions of the bible, which created confusion on the exact transliteration of the name. As a result, Catholicism, Orthodox belief and Christianity, as a whole, became nothing but the most confused and blasphemous bodies of believers, as they do not know His personal name and believing instead on a name Jesus Christ, which was not even heard when the messiah was here on earth. They are blasphemous because they opportunistically use the ‘words’ of the Father to worship a false god. Worst, they even invoke or believers would even invoke the guide of the Holy Spirit, when the substance of their belief can not be justified to be true, at all, because, everything in their belief is connected to a false name, hence, they are all false or un-true. 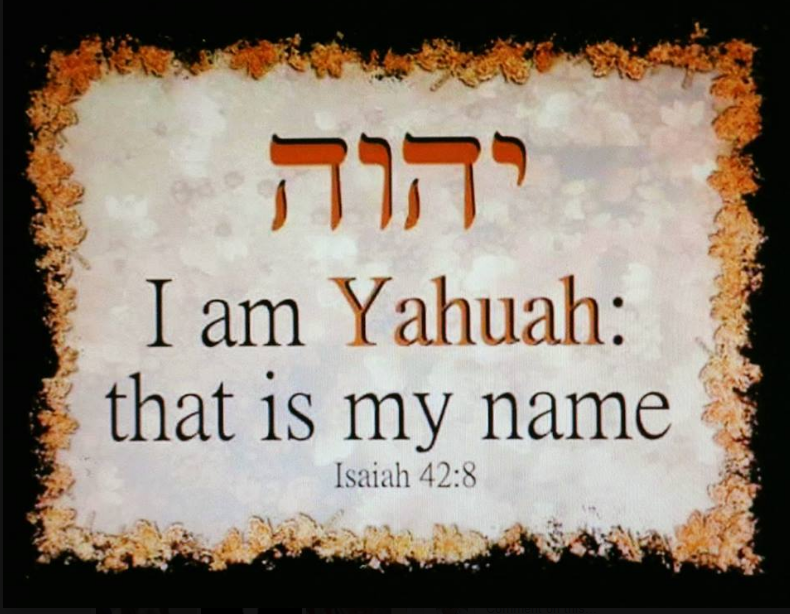 Finally, coming out as promised in the scripture, the name of the Father is discussed in the video below, which is transliterated to Yahuah, the short name ‘Yah’ in Hallelu-Yah or ‘praise Yah’, being completed by the sound of life ‘UHA’ in a newborn’s cry. Also, as life is also manifested in the name of the son, his name as what was revealed in the old testament is ‘Yahushua’, more specifically through Zechariah 6:12 in relation to Zechariah 6:11 that was erroneously transliterated to Joshua, which also bears the sound of life ‘UHA’. 13 Then people brought little children to Yahushua (Jesus) for him to place his hands on them and pray for them. But the disciples rebuked them. By aaphil in His Coming on February 20, 2018 .